After a try-laden career with the All Blacks, Kirwan is already considered a legendary figure within the game. However, he is now hoping to further enhance his reputation as a coach, with Japan. Kirwan was an 18-year-old winger learning his trade with the Marist third grade side when, in 1983, John Hart, on the advice of former All Blacks Paul Little and Eric Boggs, selected him for Auckland union's centenary fixture against a President's XV. Kirwan excelled. It was obvious that Auckland had unearthed a very special talent and, within a year, Kirwan was making his debut for the All Blacks, against France in Christchurch. The first of the numerous injuries which would blight his career arrived later in the year, before the Kiwis' tour of Australia, but he quickly established himself as an automatic selection in the New Zealand squad. Indeed, when fully fit, Kirwan was virtually unstoppable. He lit up the inaugural World Cup of 1987, scoring six tries in total, including two in the semi-final rout of Wales and a brace in the final against France. However, the pick of his scores was a stunning, length-of-the-field effort against Italy in the pool stages which announced the arrival of a fresh-faced superstar on the world scene. There was even better to come, though, from an individual perspective. The following year Kirwan scored a staggering ten tries in five tests, against Wales and Australia. Though he never quite reached those heights again - persistent hamstring trouble was undoubtedly a key factor in that regard - when Kirwan's international career came to an end in 1994, he had appeared in 63 tests for the All Blacks, scoring 35 tries - then a record. 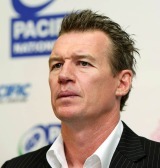 At club level, he starred in Auckland's champion Ranfurly Shield and NPC teams of 1985 and 93. Indeed, he will forever be remembered for his stunning eight-try haul in the 1993 defence against North Otago at Oamaru. He regularly lined out for Italian side Treviso during off-seasons in New Zealand and also tried his hand at rugby league, with the Auckland Warriors, before finishing up for good in Japan with NEC Green Rockets in 1999. A move into coaching followed. He took charge of the Rockets for two years before returning to New Zealand to take up an assistant coaching role with the Auckland Blues. In 2002, he was appointed Italy head coach and the Azzurri, under his guidance, enjoyed a decent World Cup the following year, racking victories over Tonga and Canada. However, despite an initially promising start to his reign, he was relieved of his duties in 2005 after a Six Nations campaign featuring five successive defeats. However, he returned to coaching with Japan at the start of 2007 and their dramatic draw with Canada in the World Cup in France later in the year arrested a run of 13 successive defeats for the Cherry Blossoms at the sport's showpiece event. Under Kirwan's command, Japan dominated the early years of the Asian 5 Nations with four successive titles between 2008 and 2011 but it was a familiar story at the next World Cup where the only highlight was a draw with Canada. Kirwan parted company with Japan following that tournament and applied to become both England's interim head coach - following the departure of Martin Johnson - and their permanent boss only to be told he lacked experience with a top nation.